In early June, 2010, Stephen Hawking was an honoured guest at an high profile World Science Festival held over several days in New York. On June 7, 2010, just after this festival had closed, Stephen Hawking was interviewed by ABC News's Diane Sawyer. Stephen Hawking's illness has resulted in the loss of voluntary actions throughout most of his body and seems to only have effective control over some of his facial muscles. Given this inconvenient reality he has to pre-compose what he wishes to say using technologies where his facial muscles movements can control the computer based composition of his thoughts. ABC News submitted a series of questions, in advance, to Stephen Hawking and he subsequently composed replies which could be played back during the face to face interview in seeming direct response to questions being addressed, during the interview, by Diane Sawyer. Stephen Hawking's responses were then not, "off the cuff," but were laboriously prepared in advance. "What could define God [is thinking of God] as the embodiment of the laws of nature. However, this is not what most people would think of that God," Hawking told Sawyer. "They made a human-like being with whom one can have a personal relationship. When you look at the vast size of the universe and how insignificant an accidental human life is in it, that seems most impossible." "There is a fundamental difference between religion, which is based on authority, [and] science, which is based on observation and reason. Science will win because it works." In Stephen Hawking's Uber-Intellectual Universe there seems to be no room for doubt that " Science will win over Religion "!!! "You will hear things like, "Science doesn't know everything." Well, of course science doesn't know everything. But, because science doesn't know everything, it doesn't mean that science knows nothing. Science knows enough for us to be watched by a few million people now on television, for these lights to be working, for quite extraordinary miracles to have taken place in terms of the harnessing of the physical world and our dim approaches towards understanding it. And as Wittgenstein quite rightly said, "When we understand every single secret of the universe, there will still be left the eternal mystery of the human heart." It is widely known that Plato, pupil of and close friend to Socrates, accepted that Human Beings have a " Tripartite Soul " where the individual Human Psyche is composed of three aspects - Wisdom-Rationality, Spirited-Will and Appetite-Desire. What is less widely appreciated is that such major World Faiths as Christianity, Islam, Hinduism, Buddhism and Sikhism see "Spirituality" as being relative to "Desire" and to "Wrath". tend to contribute towards giving rise to the "World" of Human Societies!!! This view suggests that Societies themselves!!! can often have a "Tripartite" character. How "socio-politically doctrinaire" an individual society might be. (Societies committed to Marxist ideology, for example, may not be particularly "Tripartite"). that give convincing support to such a depiction of Human Nature!!! Believe it or not even SCIENCE seems to agree with such a view!!! Mention has been made of such undoubtedly celebrated philosophers, within the Western tradition, as Plato and Kant. 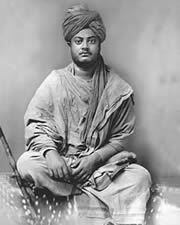 The eminent Indian holy man Vivekananda, (actually a name-in-religion suggestive of "the bliss of discerning wisdom"), lived between 1863-1902. He personally made a massively favorable impression upon the World Congress of Religions held in Chicago in 1893 and is credited with being a key figure in the broader introduction of Indian philosophy to the Western world. Religion deals with the truths of the metaphysical world just as chemistry and the other natural sciences deal with the truths of the physical world. The book one must read to learn chemistry is the book of nature. The book from which to learn religion is your own mind and heart. The sage is often ignorant of physical science, because he reads the wrong book - the book within; and the scientist is too often ignorant of religion, because he too reads the wrong book - the book without.